Captain John Tavares thinks the New York Islanders have room for improvement, even after winning three of four games. Tavares had two goals and an assist, Johnny Boychukscored for the second straight game and the Islanders beat the Minnesota Wild 6-3 on Sunday night. The Islanders are 3-3-0 and face the first-place Montreal Canadiens on Wednesday and defending Stanley Cup champion Pittsburgh Penguins on Thursday. "I still think we can get a lot better," Tavares said. "We still haven't gotten the power play going. Five-on-five certainly good to see a few go in for a lot of guys. ... So build on it and get ready for a tough week coming up." Islanders rookie Anthony Beauvillier had two assists, giving the 19-year-old at least a point in three straight games. "He played well," New York coach Jack Capuano said. "I think he's going to be a good player in this league for a long time. He just plays with tenacity, grit and determination in his game." New York failed on its lone power play, falling to 1 for 15 on the season. Zach Parise scored twice for Minnesota to top 300 goals for his career, and Nino Niederreiter also scored. Second-string goalie Darcy Kuemper made 27 saves. Trailing 1-0 early in the second period, the Islanders took the lead with three goals 3:08 apart. Tavares got a pass in the slot from Josh Bailey and fired it in for his second of the season at 4:23. Then, de Haan fired a wrist shot from beyond the left faceoff circle past Kuemper for his first of the season 34 seconds later. Boychuk capped the flurry and made it 3-1 at 7:31 when he fired a slap shot from the right point past Kuemper's glove side. After getting denied in close by Greiss twice earlier in the period, Parise pulled the Wild within one with 7:23 left. Greiss appeared to stop a slow puck before it crossed the line, but a video review showed it was across just before the goalie knocked it away with his right pad. It gave Parise 20 goals in 48 career games against the Islanders. "I had no idea, really," Parise said of the goal. "Even after they reviewed it, I was standing behind the net, and one of the linesmen asked me, `Did that go in?' and I said `I don't think so.' It really caught us off guard. I didn't see it cross and hit the back of his leg." The Islanders put the game away in the third. Quine took a pass from Beauvillier, skated forward and fired a shot past Kuemper at 6:29 to restore New York's two-goal lead. Hickey pushed the lead to 5-2 with a wrist shot just over two minutes later. The goals by Boychuk, de Haan and Hickey gave the Islanders five goals by defensemen in the last two games, after Boychuk and Dennis Seidenberg scored in the 3-2 win over Arizona on Friday night. Niederreiter, the No. 5 overall selection by the Islanders in the 2010 NHL draft, pulled the Wild within two with 2:48 left for his seventh point (four goals, three assists) in seven games against his former team. Tavares added an empty-netter with 1:43 left to cap the scoring. Andrew Ladd, the Islanders' top free agent signing in the offseason, had an assist for his first point with New York. After a scoreless opening period, Parise got the Wild on the scoreboard at 1:15 of the second with his 300th goal and first this season. NOTES: Coming off a 2-1 OT loss at New Jersey on Saturday night, the Wild played the first of 13 sets of back-to-backs this season. ... Minnesota lost for the first time when scoring at least three goals. ... New York D Ryan Pulock was placed on IR on Saturday and is expected to miss 4 to 6 weeks with a lower body injury. Pulock lasted only five shifts in the first period of his season debut in Friday's 3-2 win over Arizona before his injury. ... New York announced LW Eric Boulton cleared waivers and was assigned to Bridgeport of the AHL. ... The Islanders improved to 3-1-0 at home against Western Conference teams this season, and 15-1-2 against West teams at Barclays Center since moving to Brooklyn before last season. Wild: At Boston in the third game of a four-game trip. 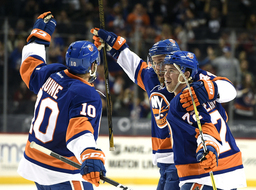 Islanders: Host Montreal on Wednesday night in the conclusion of a five-game homestand.